Mt. Stuart (9,415’) is the 6th highest mountain in the state and the apex of an incredible eastern sub-range of high peaks in the Central Cascades. The peaks here are composed of excellent granite – highly fractured, textured, and solid. 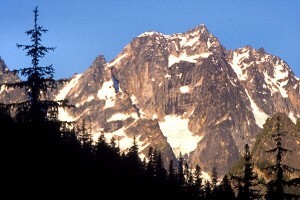 The North Ridge of Mt. Stuart is a quintessential alpine classic. If you were to pick only one alpine rock route to do in the Cascades, this should be it. -This perfect ridge splits directly up the steep north façade of Mt. Stuart rising in nearing 3000-feet of awesome granite, splitter cracks, exposed knife-edge ridges, and just plain fun climbing.